A few days ago I was forcefully reminded of how our "universal view", and our expectation of future progress in astronomy and astrophysics has been so completely changed by our remote presence in space. Last week as I was browsing in our local Oxfam book fair, and I came across a copy of Sir Fred Hoyle's modestly titled book, The Nature of the Universe, published in 1950. I snapped it up eagerly (it was only 70p!) and took it home and started reading it. It was absolutely fascinating reading. Even taking into account Sir Fred's well known penchant for fringe theories, it made me realise that just 50 years ago we had a completely different view of the universe. Intriguing though that was, what struck me as particularly relevant to Flash! was his view of the direction of future progress in observational astronomy namely that "there are no new fields to be opened up by the telescopes of the future"! I think that this is partly due to his well publicised view of steady state cosmology, but it is also at least in part due to a mindset dominated by optical astronomy at visual wavelengths. Clearly he, and presumably many other astronomers of the time, were not expecting a revolution in our perception of the universe brought about by viewing the universe in the new ways made possible by the space age, and by advances in detection technology. Suddenly the universe has become a more diverse, strange and definitely a more exciting place. Happily the "more of the same" predictions proved false. 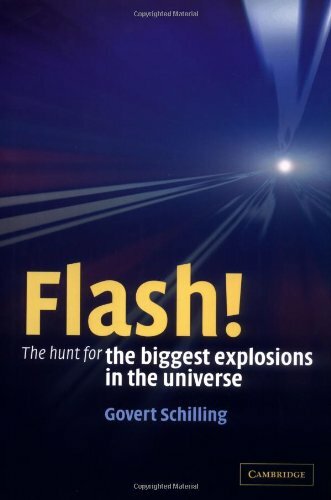 Govert Schilling's popular account of the discovery and first 30 or so years study of gamma ray bursters is a book about the birth and childhood of a new area in astrophysics, gamma ray bursters (GRBs) which resulted directly from such technological advances. With the recent launch of the HETE 2 satellite, dedicated to the detection and multiwavelength observation of GRB's and the upcoming launch of the Swift satellite (hopefully in autumn 2003), gamma ray burster research can be said to have matured to adulthood. So the end of childhood is then a good point at which to look back, review progress, and see how it all happened, and this is what the book does, covering the period 1969 to 2000. The story starts in 1969 with the Vela series of military satellites which were designed to pick up gamma rays from covert nuclear tests in space. Fortunately they didn't detect any, but they did find strange bursts of gamma rays. The Vela satellites were never designed to pinpoint the location of such bursts on the sky to any precision, so it was not known at that time whether they were isotropically distributed, or followed a distribution similar to the stars in the Milky Way. Initially almost everyone assumed that GRBs were a phenomenon local to our galaxy, probably due to explosions at the surface of neutron stars, and so they were expected to be distributed like the visible stars. Even when the BATSE experiment on the Compton Gamma Ray Observatory demonstrated that their distribution was isotropic there was an understandable reluctance to accept the obvious conclusion that GRBs are located at cosmological distances, after all the energies that this implied were huge. This issue was settled when the first optical afterglow was detected in 1997, and the GRB was shown to be associated with a distant galaxy. It is now known that GRBs come in two "flavours", long and short duration bursts. The short duration bursts are still a bit of an enigma because, as they only last anything from milliseconds to a couple of seconds, it is almost impossible to catch optical counterparts. The long duration bursts have been far better studied, and the currently most popular theory for their origin involves so-called "collapsars", extremely massive rotating stars that are so heavy that they form black holes rather than neutron stars. The alternative theory of colliding neutron stars is wounded, but not yet dead. Exciting though it is, the academic tale of discovery is not the only theme of this book. It also endeavours to tell the human side of the story, the sociology of scientific discovery using the tools of "big science". I think that this is an important and interesting side to the book. It does give an outsider a good view of how large international collaborations operate, and the strains placed upon them by the need for instant decision making, and the desire to be the first to observe something. It also shows that scientists come in all mental shapes and sizes. Some like big ideas, some like chasing high risks and big rewards, some prefer to work at a gentler pace while some are good at logistics and organisation. If it proves anything it is that it takes many different approaches to ultimately tame a phenomenon of nature as weird as a GRB. My only criticism of the joint approach of "science" plus "sociology" is that sometimes, following the human side involves us in loosing the chronological thread of the science. However all in all I think that this book is a really important addition to anyone's popular science bookshelf, well written and on a subject whose potential for unlocking the early history of the universe is yet to be unleashed.